The murals of Bonampak provide an unmatched source of documentation about the ancient Maya world. They let us see the kinds of weapons used in battle, the musical instruments played during celebrations, and the elaborate costumes worn on special occasions (picture 1). With the aid of the texts in the murals, Stephen Houston and others have been able to decipher the titles of messengers, singers, and other people of the royal court. 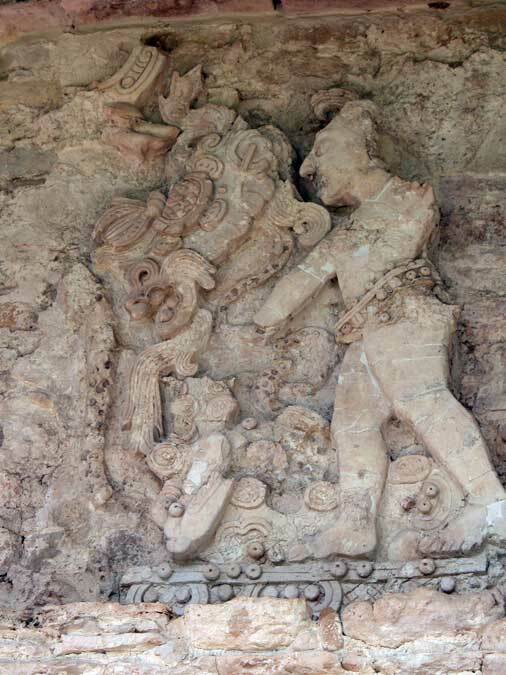 Women and children, infrequently depicted on monumental stone sculpture, have their place in the Bonampak murals as well, offering an intimate glance into rarely-seen parts of the Maya world. Yet as important as the Bonampak murals are as a source of evidence about ancient Maya life, what is equally thrilling is the insight they provide about Maya artistic practice. Nearly every available surface is painted, from the riser of the bench to the capstones of the roof vault (picture 2). 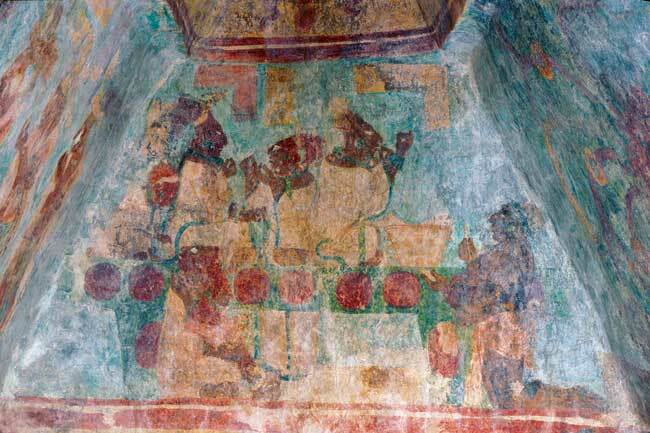 Over thirty distinct pigment combinations grace the walls of Bonampak, more than in any other surviving Maya painting. The murals combine many familiar poses and themes into a work of new and striking complexity, demonstrating the power of art’s ability to tell multiple and conflicting stories. 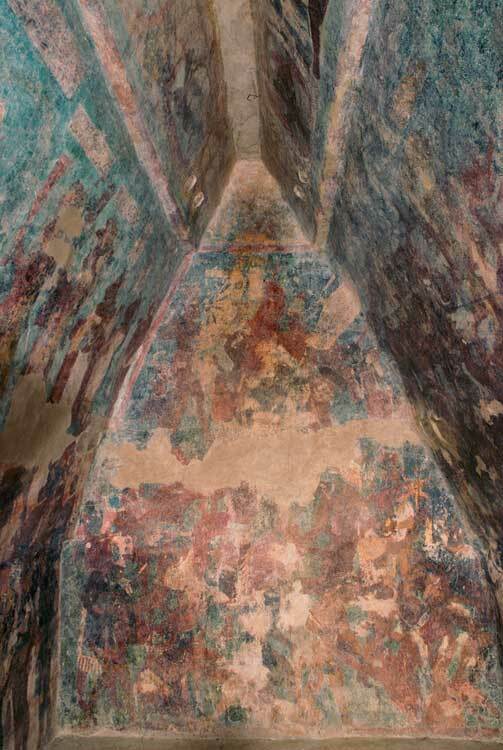 The murals are housed inside Structure 1, a modest building located midway up the Bonampak acropolis (picture 3). Structure 1 has three rooms, each with a separate entrance (picture 4). The outside of the building is decorated with stucco reliefs showing seated rulers and the taking of captives, providing a simple narrative of royal victory and authority which would have visible from the plaza below (picture 5). Inside, the murals tell a more complicated story, involving a far larger set of actors. In Room 1, the focus is on dance and celebration. Three beautifully-costumed royal youths perform a quetzal dance on the lower part of the south wall (picture 6), flanked by processions of musicians and performers on the east, west, and north (see pictures 1 and 17). Above the dancers, a group of ebeets, or messengers, stand talking amongst themselves (picture 7). These emissaries from other courts pay little attention to the royal family seated on a throne high on the western wall (see picture 14), or to the child being presented in the southwest corner (see picture 16). A text running between the two registers records the dedication of the building in AD 792. Turning around to face the north wall, one sees performers on the lower register, positioned as if they have just entered the room. Above the doorway, the royal princes prepare to dance, donning their heavy feathered backracks (picture 8). War is the subject of Room 2. The east, south, and west walls are filled with the tumult of a great battle, involving over 100 combatants, where the chaos of figures approximates the chaos of warfare (picture 9; see also picture 15). Yet the outcome is already foreseen: the victorious warriors wear elaborate war costumes while the defeated have by and large already been stripped of their arms and armor. On the north wall is the aftermath of battle: the torture and sacrifice of the captives, within the city, performed for all to see (picture 10). While this is ostensibly a scene of triumph, with Bonampak’s king, Yajaw Chan Muwaan, standing victorious at the top of the pyramid, the royal figure is in fact shadowed by the vault, and the eye is drawn instead to the sprawling body of the dead captive placed directly above the door (picture 11). The story of the defeated upstages the celebration of victory in a powerful subversion of artistic norms. Room 3 features another celebratory dance, taking place on the steps of a giant pyramid which has been compressed onto the east, south, and west walls (picture 12; see also picture 2). Ten elaborately-costumed dancers, wearing sunflowers in their feathered backracks and decorated dancers’ wings at their waists, perform on the steps of the pyramid, while musicians crowd the north and west walls. The dance is observed by messengers on the north wall, and by the women of the royal court, seated on a throne on the protected inner east vault (picture 13). But violence is not far away from this scene of celebration - at the very center of the south wall, now badly damaged, the body of a sacrificial victim arches over the vault spring, thrust into three dimensions. His heart has just been removed. The story in the Bonampak murals is not a simple linear narrative, starting in Room 1 and ending in Room 3. Instead, the three rooms are fairly independent, each telling a self-contained story, albeit one featuring some of the same protagonists. This flexible program demands active engagement and interpretation on the part of the viewer; it may also allow the structure to be used in different ways on different occasions. Considered together, Rooms 1 and 3, with their dances and celebrations, bracket the very different scene of warfare in Room 2. The story moves backwards and forwards in time, starting with a dedication ceremony of 792 in Room 1, stepping backwards to the year 785 in Room 2, and moving forwards to an unspecified moment, perhaps one close to the dedication, in Room 3. Themes often recur, with echoes and inversions, and subtle but significant changes: the messengers of the south wall of Room 1 reappear on the north wall of Room 3; the royal family is pictured on a throne on the protected inner west vault of Room 1 (picture 14) and again on the protected inner east vault of Room 3, but this time missing the central male figure - the king (see picture 13). Indeed, the murals hint at a story of political uncertainty and upheaval at odds with the triumphal majesty of the celebrations they portray. 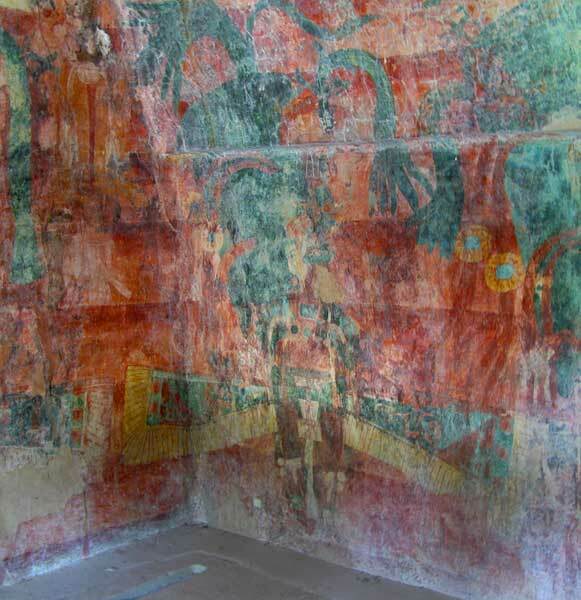 The best-known ruler of Bonampak, Yajaw Chan Muwaan, is pictured only in Room 2, where he seizes a captive with such force that he seems to fly off the painted surface on the south wall (picture 15). Yajaw Chan Muwaan also presides over the sacrifice of prisoners on the north (see picture10). But it is difficult to identify the king in Room 1. 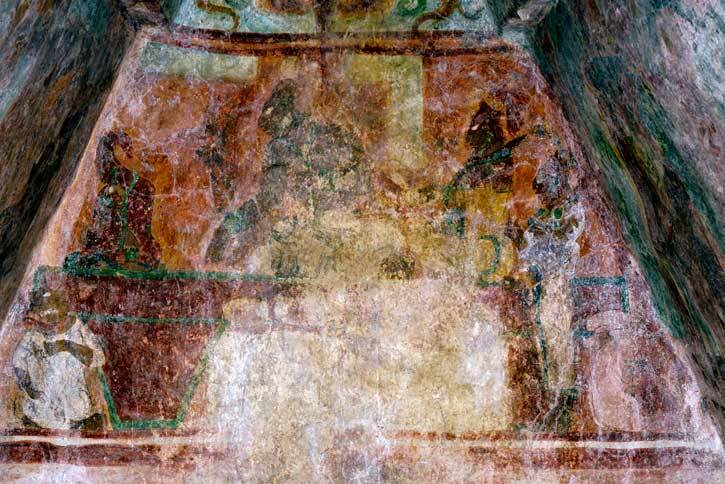 Perhaps he is the figure seated at the center of the throne on the west wall, hard to see in the shadows of the vault, but the space reserved for a caption to name this figure was never filled in, leaving his identity ambiguous (see picture 14). Yajaw Chan Muwaan cannot be identified at all in Room 3, where the focus is instead on the three beautifully-costumed ch’oks, or royal princes, who dance so prominently on the south wall. These three royal princes are the most frequent protagonists in the murals, always accompanied by completed captions providing their names and royal titles (see picture 6). Yet there’s tension here as well: the princes occupy the most visible positions in most rooms, but this makes them especially vulnerable to the gaze and to touch. They are now the most damaged figures in the murals. The discovery in 2010 of a tomb underneath the floor of Room 2 raises new questions about the program. Who is buried here, with such a modest assortment of vessels and jade beads? Could it be the body of Yajaw Chan Muwaan? Did he die as the painting was being planned, and does the prominence of the three ch’oks signal the jockeying for power in his succession? The child being presented in Room 1, long thought to be their heir to the throne, is female, as Heather Hurst first noticed (picture 16); this along with the three royal princes, suggests challenges in succession. 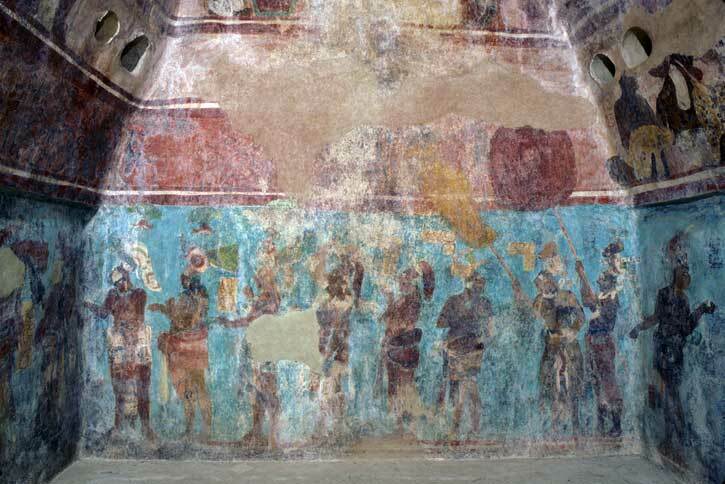 There’s another absence in the mural, and that is the king of Yaxchilan, the large and powerful site of which Bonampak was a dependent and ally, who may be the ultimate consumer of the painting. 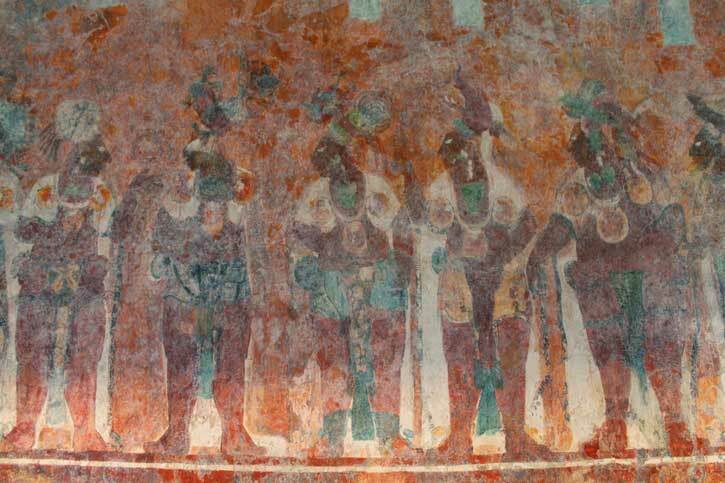 Yet the real protagonists of the murals are not the kings but the royal court - the multitude of attendants, musicians, performers, warriors, and messengers who crowd the walls of Bonampak in unprecedented numbers, each claiming the right to be represented. Growth in the ranks of elites was one of the challenges facing Maya society in the decades before the collapse, and at Bonampak, we see an unwitting document of the tensions this growth produced, perhaps just years before the site was abandoned. The sheer presence of so many courtiers serves to undermine the narrative of royal authority in the paintings, as does their persistent inattention to the spectacle presented on the walls. Messengers gossip amongst themselves (see picture 7); one performer even stops to smoke a cigar (a Maya invention), indifferent to the world around him (picture 17). 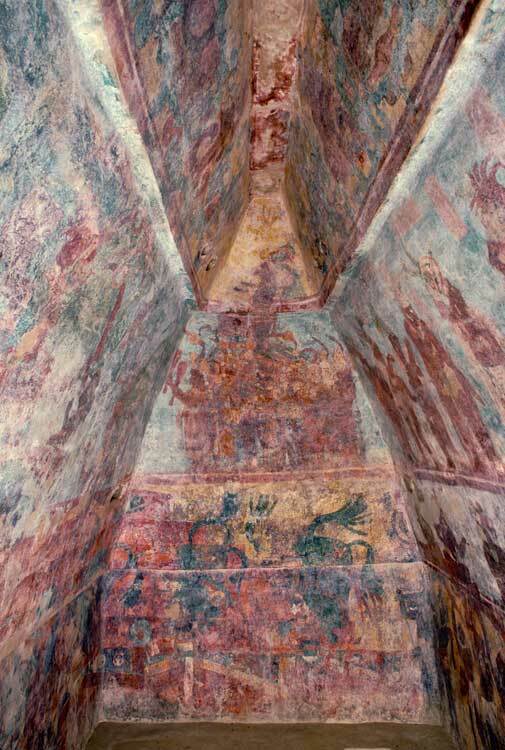 The triumph of the Bonampak murals is how they envelop the viewer in these multiple stories, dwelling with equal care on the humble performer and the exalted prince. They were made to be experienced: inside each room, the viewer is surrounded by painted figures, two-thirds life size, scaled to the height of a person seated on the bench which occupies most of the interior space. Lit only by the narrow doorways, the rooms would have been dark and close, the painted figures a shadowy presence seeming perhaps all the more real for not being perfectly visible. Yet we owe the survival of the Bonampak murals purely to chance. A leaky roof caused a protective layer of limestone calcifications to form over the murals, allowing them to survive while so many others disappeared. They are the last work known from Bonampak. • Miller, Mary Ellen, and Claudia Brittenham. 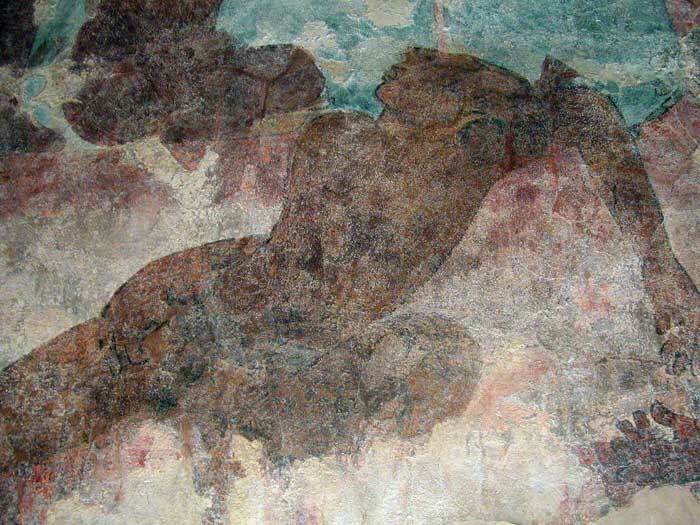 The Spectacle of the Late Maya Court: Reflections on the Murals of Bonampak. Austin: University of Texas Press, 2013. • “Descubren entierro.” Instituto Nacional de Antropología e Historia boletín, 2010, http://www.inah.gob.mx/index.php/boletines/14-hallazgos/4077-descubren-entierro. • Fuente, Beatriz de la, and Leticia Staines Cicero, eds. 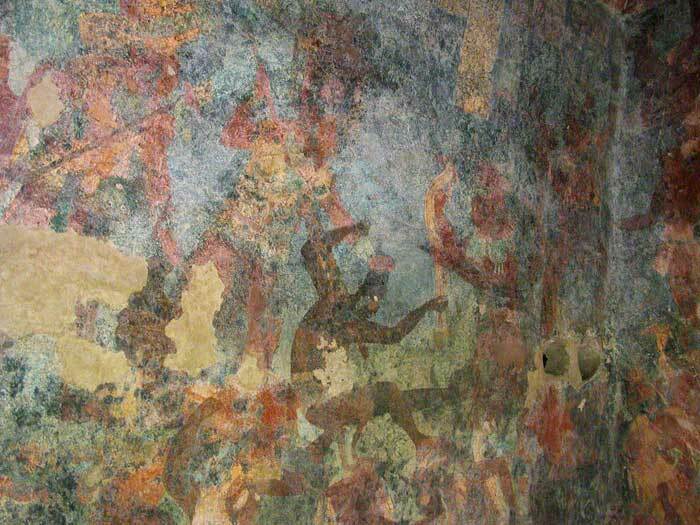 La Pintura Mural Prehispánica en México II: Área Maya - Bonampak. 2 vols. México: Universidad Nacional Autónoma de México, Instituto de Investigaciones Estéticas, 1998. • Houston, Stephen D. “The Good Prince: Transition, Texting, and Moral Example in the Murals of Bonampak, Chiapas, Mexico.” Cambridge Archaeological Journal 22, no. 2 (2012): 153-175. • Miller, Mary Ellen. “The willfulness of art: The case of Bonampak.” Res 42 (2002): 8-23. • Miller, Mary Ellen. The Murals of Bonampak. Princeton: Princeton University Press, 1986. • Ruppert, Karl, J. Eric S. Thompson, and Tatiana Proskouriakoff. Bonampak, Chiapas, Mexico. Publication 602. Washington, D.C.: Carnegie Institution of Washington, 1955. • Villagra Caleti, Agustin. 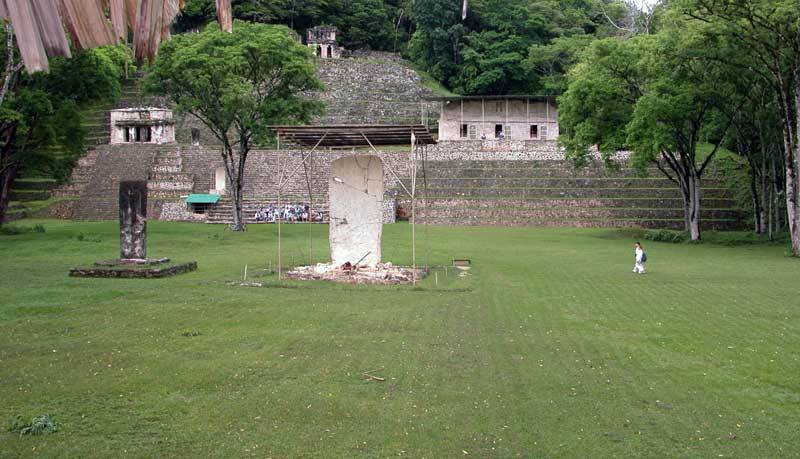 Bonampak: La ciudad de los muros pintados. Mexico: Instituto Nacional de Antropología e Historia and Secretaría de Educación Pública, 1949. • Pic 7: Photo by Inakiherrasti. Licensed under CC BY-SA 3.0 via Wikimedia Commons - link below. • Pic 17: Photo by Justin Kerr © Bonampak Documentation Project, 1996.